Rarely do all of these conspiracies tie together, because just like any good faith, they tend to contradict each other. That said, I have met at least one person who has never met a conspiracy she couldn’t love. She drops the name ‘Illuminati’ like it were just another established fact and believes in global conspiracies that range from the forced emasculation of males (literal or figurative?) to the notion that a unique isotope (my word, not hers) of gold transforms people and allows us to use more than 10% of our brains**, and the world governments secretly possess it and fight over it. I have no interest in going through all of these conspiracies and trying to refute them. There’s no point. If you believe Barack Obama was born in Kenya, still, it’s obvious nothing will ever convince you otherwise. You’re not looking for evidence, you’re holding onto a reason to remain prejudiced (or you’re just trying to goose ratings for you reality TV show). It’s kind of an accepted fact that the best conspiracy theories (like the best religions) are those that cannot be proven wrong because there is always a window open for adaption. But, frankly, even crap conspiracy theories will survive as long as someone is willing to believe it (Flat Earth Society, anyone?). The mind that seeks conspiracies is a mind more interested in a compelling story than facts or logic. Note, I said ‘compelling,’ not coherent or cohesive. We all seek stories to explain experiences or phenomenon. It’s an evolutionary trait. It’s the reason for myths, fairy tales and religions (I mean, other than that one true religion, [Fill in the blank]). It’s the reason science exists. It’s also the reason that we sit around obsessing over what that girl meant when she said, “We should hang out sometime.” We create narratives. Smart people do it. Dumb people do it. People with faith do it. Atheists do it. Conspiracy theories are just another form of narrative building, but on crack. The classic conspiracy theory usually assumes some body of power exists which has a secret agenda (presumably that we normal humans would oppose if we knew about it). They have devised a complex, almost certainly nefarious means of achieving their goal, which has resulted in an ever widening net of lies, misdirections and false ‘facts’ to throw us plebeians off the scent. When I hear a conspiracy theory (in whatever form it may take), my first thought is: Where is this going? In fact, instead of trying to argue facts with conspiracy theorists, I’ve taken to pulling a maneuver out of every 3-year-old’s handbook and just ask, “Why?” ad nauseum. “Why did Bush and Cheney (or whoever) arrange 9/11?” To invade Iraq. To get oil. To create opportunities for Halliburton. And the response that follows starts to break down. OK, but maybe 9/11 wasn’t about money and oil. It’s just about power. They needed a terrorist attack to create an atmosphere of terror in order to seize even greater power through the Patriot Act and other means. Either this conversation turns into a big circular argument (they wanted power to control people, and they wanted to control people to have power) or there is some long game being played here that either has failed or is completely staggering in its scope. Sure, under Bush the Executive branch finagled some extra powers and some rights were curbed. But, really (unless you’re Middle Eastern), how much have your personal freedoms really been hampered? To borrow a Chris Rock quote, is there really anything you can’t do on Wednesday because Bush won? Obviously, there are some troubling aspects of laws passed by both Bush and Obama, but they’re hardly of the Orwellian scale one would expect from the sort of global conspiracy necessary to fake 9/11. I guess what I’m saying is, this fascist takeover is kinda a let down. If you want me to believe your conspiracy theory, you need to do a little better job of explaining why such elaborate schemes are needed to bring about rather unimpressive results. I know we’re never supposed to trust the “official story,” but usually the official story makes a whole hell of a lot more sense than what ever cockamamie theory you are spouting. People love to believe in secret power pulling the strings. Maybe it’s God, maybe it’s the Illuminati, maybe it’s the Boy Scouts. But somebody has to be manipulating the world, right? Because the alternative is that we’re just a bunch of people on this planet with pretty basic wants and desires and sometimes in the pursuit of them we come into conflict with someone else. Sometimes we’re bad people; sometimes we create plans in order to meet our needs and those plans hurt other people. It’s not a conspiracy, it’s just humanity. Most of the supposed conspiracies in the world can be explained by ‘emergence.’ There are multiple, intelligent actors interacting, all in pursuit of their own ends. These interactions create networks of events and circumstances and then we stand back from them and we see patterns, like the shape of a butterfly in a cloud. These patterns couldn’t possibly have arisen by pure chance and chaos (we think), so there must be a conspiracy to explain it. Your average conspiracy theorist is like your average American Christian: You have these beliefs but rarely do said beliefs play a substantial role in your day to day life***. 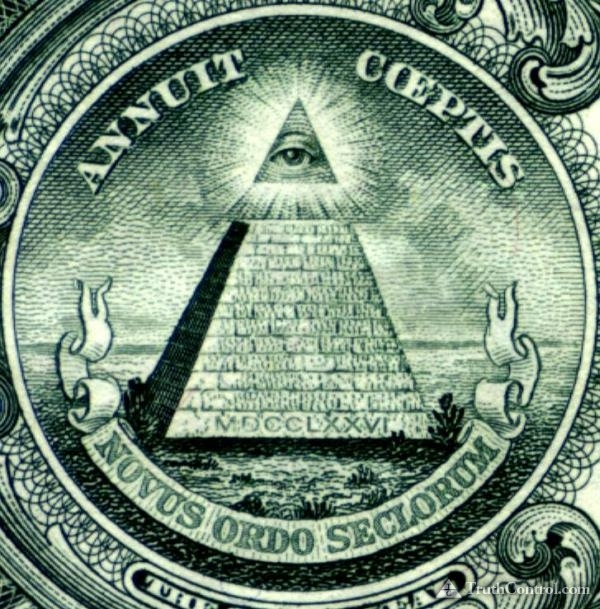 The Illuminati might control the world’s gold supply, but you’re still going to go to work today and buy your Starbucks coffee and log into Facebook and generally play into the world system that you decry as a sham. It’s enough to have your story, you don’t really care about the consequences. You might not believe in the Illuminati or 9/11 conspiracies or anything of that sort. But there is some conspiracy lurking in your mind that you flick at like it was a loose tooth. It’s probably about the pharmaceutical companies or Wall Street or food manufacturers. It’s not just that you think they pursue policies that might be harmful in order to make greater profits. You think that they are secretly controlling politicians, laws and government policies all in order to get richer. Maybe. But it begs the question, “Why?” Considering the amount of years and money it would take to set all these pawns in place, might it not be more realistic to believe that [Fill In the Blank Profiteer] is using legal, albeit ethically questionable means to benefit themselves, the same way you might use your friendship with a manager to get a better schedule at work. Yeah, the system might be rigged in certain groups’ favor, but I’m not convinced it was a conscious decision by a secret panel of shadowy figures. Occam’s Razor tells us that the simplest answer is usually the best answer. Rarely is a conspiracy theory simple. In fact, complexity is one of the strengths of a good theory, because it makes it harder to disprove or even completely understand. Generation and generation of Hollywood movies and comic books have bred us to believe in evil villains who aim to control (or, for some reason, destroy) the world****. But reality is far more prosaic. There are certainly dictators in the world, and that’s a whole other issue. But here in America, most of the ‘villains’ are really just people whose individual goals don’t align with our own. It’s possible for me to find certain Republican policies repugnant without thinking they all hate women. And it’s possible for you to oppose ‘Obamacare’ without having to claim it’s an attempt to turn America into a Socialist State (it’s not). And if the answer requires more steps than the ‘official story,’ you’re probably just enjoying a good ol’ fairy tale. *When I say that government being manipulated by corporate interests is a conspiracy theory, I’m not talking about Citizens United or Super PACs or lobbyists. It’s a well established fact that corporations use their money to influence politicians. I mean on a larger scale, a more systemic manipulation that involves buying off scientists (or relevant experts) and any governmental official all to line the pockets of a small group of power players. **The 10% myth is a frequent player in a variety of conspiracy theories, as well as for homeopathic ‘cures’ and mystic healing. If we could just rid our collective consciousness of this utter bullocks, we might save a lot of gullible people a lot of money. Probably not, actually. ***And just like any religion, there are fanatics whose beliefs completely guide every aspect of their lives. ****Notice how these movies about World Conquering Villains usually fall apart in the 3rd act? Because even the best writers have a hard time coming up for a legitimate reason why anyone would want to conquer the world. Any villain smart enough to take over the planet would realize that he could just make a billion dollars and have the world hanging from his nuts. No henchmen required.